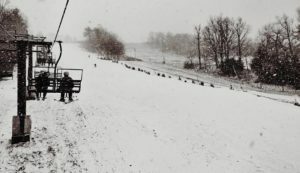 Boalsburg, PA – Skiers enjoying their first turns on opening day at Tussey Mountain in Pennsylvania got more than they bargained for. Shortly after 10 a.m., four chairs on Tussey’s base-to-summit fixed grip quad chairlift slid backwards into a fifth chair, trapping riders between the chairs. “A chair carrying skiers and snowboarders slipped upon the haul rope and slid backwards into the chair following it, which caused a domino effect that subsequently resulted in a total of four slipped chairs,” Tussey Mountain officials confirmed in a prepared statement. Ski patrollers and rescue crews evacuated the estimated 50 to 100 guests from the disabled chairlift. Five minor injuries were reported.